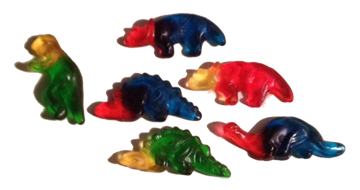 Home » 5 Freshest » Haribo Dinosaurs: Can we take a little credit here? Haribo Dinosaurs: Can we take a little credit here? 10 years ago you couldn’t find a decent gummi bear this side of the Atlantic. They existed of course but you had to travel to weird little tea & coffee houses that had them in mini already-packaged amounts like 1/4 lb for $1.50. Now? You can get them in every Walgreens, Safeway and airport. And it’s a great thing cuz see that’s why the Gurus started this site – to find, review and rap humorously about gummies. Ok maybe not gummies entirely but THEY are my (our) favorite candy and I’d (we’d?) rather review them over just about anything. So us Gurus be reviewing these little bears, which led to pickles which led to snakes which led to smurfs and finally dinosaurs. Maybe I missed a few varieties in there, #butstill, there’s a ton now and you can blame us! The good folks at Haribo are ripping gummies out faster than we can review them probably BECAUSE we are here reviewing them. See how meta this gets? Like most Haribo, it’s hard to know the exact flavors in the Dino bag as they aren’t listed on the package. 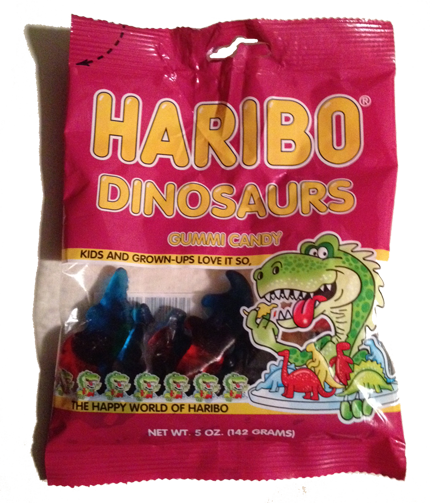 Yet, unlike most Haribo gummies, these Dinos have a stronger, deeper flavor throughout the entire chew. Haribo’s tougher, chewier gummis are known for pervasive but subtle flavors. Perhaps the opposite of an American sensibility – the Haribo taste is underneath, tasty but not hitting you over the head, like a Hot Tamale let’s say. But these Dinos are almost on the tart side. Very citric-acidy even. I couldn’t quite get the flavors though. Maybe a lemon lime, a tutti frutti (yeah I have no idea what that is either), and another…not sure. Some of you may like these more than Haribo bears, as they have a more ‘in your face!’ flavor profile. Go check these out and let us know what you think. And when you do buy, poor a few ounces out for the homie Hans Riegel, the man who started Haribo and sadly died last week. Ruhe in Frieden. I’m eating a pack of these right now… They’re very tasty. The flavors here are more entertaining than the bears’… However, I don’t think there is a tutti frutti flavor here. I think what you mistook for a mix of fruit flavors was actually blueberry/mint and it’s in the blue color. Yellow, of course, seems to be banana. Red is strawberry…. Green is lime. So far that I can tell. Blueberry mint flavor? Are you suuuuuure? HowdImissthat? Haribo using Guava? mmmm, it’s very strange for me that. But maybe you’re right and from the south american factories they send some exotic flavorus to the USA. Mmmm.